June is a high-powered banker in New York City. She sleeps, eats, breathes her work. She has very little contact with her family anymore, especially since her younger sister slept with her boyfriend. In fact, they live in Seattle, and NYC was about as far as she could get. Her job (closing small businesses in foreclosure) doesn’t leave her much time to travel, either, so she doesn’t even go home for Christmas. Her aunt was sad that June didn’t come back home for Christmas. . . and there was a reason why. She was dying but didn’t share this over the phone with June. June found out some months later with a letter from her aunt’s attorney that everything was left to June. Her aunt’s business was a children’s bookstore that had been in business since 1943. June think she is just going to go out there to Seattle, sell it off, and get back to her “real” life. However, she is reminded how much she loved her aunt and loved the bookstore once she gets there. She also discovers that her aunt was best friends with Margaret Wise Brown, author of Goodnight, Moon, and many other children’s book. I totally enjoying reading this book. I liked the dualilty of June’s story paired with her aunt’s story. I must admit that parts of this book is rather unrealistic, though. June falls in love with Gaving, the business owner next door, and Gavin falls in love with her even faster. . . for one thing. 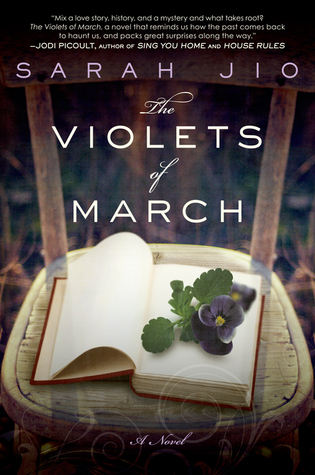 Again, like Jio’s other title that I recently read (The Violets of March), I wondered why, when June discovered the letters and clues her aunt left, June just didn’t get moving and discover the truth that much sooner. . . like Violets and the diary – why weren’t the characters so interested that they just didn’t stay up all night trying to read/find them all? Overall, I really enjoyed this book, and do recommend it. Emily’s Great-Aunt Bee invites her spend a month at her home on Bainbridge Island in the Puget Sound. Emily had written a very popular novel years before, but now she has major writer’s block . . . in part because her husband has left her for another woman. On the island, Emily remembers wonderful childhood summers spent there in the home of her Aunt Bee. It is a wonderful place to take a break. In the drawer of the “pink bedroom”, she discovers a diary written in 1943. As she reads it slowly, she begins to discover the connections to her own life, both literally and figuratively. This book appealed to me personally because I loved genealogy mysteries. This book in part includes this very appealing aspect. I could not stop reading this book, and even tried to read while cooking at the stove! I think the only real criticism of this book that I have is that if I were the main character, I would have real the entire diary in one fell swoop – even if that meant staying up to 4 am. She instead seems to just read an entry or two a day, and I found that alone extremely annoying. I realize that the story needed to unfold a bit more slowly, but I do question if that is what would really happen in real life! It was nice. I just read the first one of this series (Amish Brides of Pinecraft) four weeks ago, and it was nice, too. They are fairly fluffy romances (and labeled “Fiction/Amish” on the back.) I like light reading every now and then. Penny is New Order Amish, and living in Pinecraft, Florida. Even though she is now 24, she has always lived at home, and has never even held a part-time job. Her sister was brutally murdered 12 years before, and now her parents remain very overprotective. She has now decided to make friends, get a job, and in the midst of this, finds love. Jean is in her 60s, and just kind of drifting through life right now. She has her daily rituals concerning grieving for her husband who died a couple of years before. However, she somehow, accidentally, started a book club that met in her home once a month. Food is a big thing for he book club, except that she is not the best cook. Everything is disrupted (and int the end, for the good) when her son-in-law calls to tell her that her daughter is an alcoholic, and is in the hospital for alcohol poisoning and a broken wrist. There she discovers that her teenaged granddaughter is acting out to get attention because her parents seem to not care at all. Suddenly her granddaughter (who loves books and reading, too) is living with her and life for them both is changing. Overall I like this book, and I just had to keep reading it how it would end! (I give it four stars of five.) However, I thought we were going to hear more about the women of the book club when I first chose this book to read. Some of the book club women seem very flat and undeveloped. It would have been nice to be able to get to know them a bit more. Sarah Anderson quit law school after one year, and has been bouncing around jobs ever since. Now, she has acquired a job she loves as a court clerk for night court in Washington D.C. However, it all seems a little strange right from the start. Her first night in the courtroom of Judge DuBois is anything but normal. In fact, she almost dies when the defendant attacks her, and the Head of Security saves her life. (And no, she doesn’t become a vampire.) Read this book to find out what happens next! It is actually a fairly light read that is perfect for the summer, or anytime you want a little bit of adventure and a bit of fright. Jake just seems to be kind of floating through life. Things are working out smoothly for him. He loves horses with a passion, and has managed to go to blacksmithing school (although I am left wondering because don’t Amish frown on further education?) Now has an apprenticeship with an Amish blacksmith business shoeing horses. He also gentles horses on the side. There is a young woman, Amanda, whom he is courting. He is thinks she is very pleasant to be with. Jake is relatively non-emotional and likes things on an even keel. Then Priscilla, niece of Jake’s employer, returned home from living in Indiana for the past six years. In these six years, she has grown up, and mostly moved beyond the anger and grief she was in the midst of at age 14, when her mother died unexpectedly. This book is an interesting read because it is from the Amish male perspective (when most Amish fiction books seem to be from the female perspective) and yet manages to bypass what is really going on with Jake until near the end. Jake seems to think that Priscilla is the one not dealing with the past, when really Jake has a lot more in his past (his early childhood past) that he needs to seriously deal with before he can truly love anyone else. One of the things that annoyed me was all the discussion about horses. Horses are nice, but personally, I am not a horse enthusiast. If you can get past all of the horse terminology, then you may enjoy this book. Summer Reading Online, 7 of 30 books. I began reading the Princess Diaries series the moment the library I worked at received the first book when it was newly published (and it had been processed.) I remember reading it in the staff room during my 15 minute break one early evening. I took it home and finished it. I read every book in the series as they were released over the next several years. I even listened to one or two on audio in my car (even thought I’d already read them.) I met Meg Cabot in person in 2004, and somewhere I have a picture with her. I was a fan of hers in the earlier days of Facebook. . . So naturally very excited when I heard that Royal Wedding was to be released. I was the first (and only) on the waiting list for my local public library’s copy. Let me say: It did not disappoint! In fact, I took extra long to read it because I didn’t want it to end. I enjoyed it that much. Mia (Princess Mia for the uninitiated) turns 26, and Michael proposes finally during a surprise vacation birthday. What ensures from there . . . it wouldn’t do to give away too much more, but this book is nearly perfect. All of Mia’s friends are present, old and new, too. I do rather hope there is another book in this series . . .